Ultrasonic’s thoughts: Boom! Studios’ Mighty Morphin Power Rangers, Vol. 1 | The Arcade Archives! When it comes to licensed comic books, audiences always have a bit of a weary attitude towards them. This is usually because these types of comics don’t really have any kind of sufficient quality to get audience’s attention besides glancing at the cover and browsing through some of the pages. As such, Power Rangers was no different back in the 90s. Although it was at the height of its popularity during the mid-90s, the comic book adaptations weren’t much to write home about. So when Boom! Studios got permission from Saban-Brands to do a brand new comic book series based on Power Rangers, no one really had a clue what to expect, even with having veteran writer Kyle Higgins (Nightwing, Batman Beyond) on board. But once the first issue debuted, not only were doubts put to rest, but audiences were surprised beyond their expectations. With this series, audiences get reintroduced to the classic six characters – Zack, Kimberly, Billy, Trini, Jason and Tommy once again, as well as other well-known favorites like Bulk and Skull. The setting takes place just shortly after Tommy joins the team, but things take on a more realistic tone because while the setting is post-Green With Evil, it is not in the same continuity as what we saw on the TV show for Tommy is very much being haunted by images of Rita taunting him, and in addition to that his stress affects his ability to command the Dragonzord, which adds a whole new wrinkle to things because in the show the zords were never affected by the Ranger’s emotional state – aside from Tommy’s Red Battlezord in the Zeo season. With this a new sense of danger is added, for unexpected consequences can result. In addition, audiences can see snippets of people expressing their opinions on the new Green Power Ranger and wondering why he would switch sides with them all of a sudden. 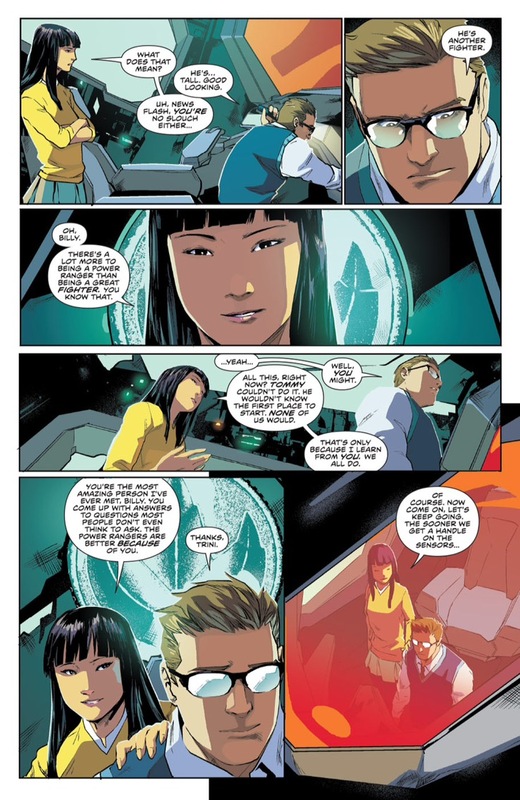 Not only that but you also get a sense that some of the other team members are weary of Tommy, which is a very organic thing because while he isn’t under Rita’s control anymore, the weariness is still there not only because they don’t know him all that well, but as Zack points out, Rita doesn’t just pick anyone to be her own personal Power Ranger, which raises a question as to what kind of person he is. Of course, there is another reason as to why Zack specifically feels like this which audiences don’t learn until later, but it is one of those little tidbits that even if you don’t file it away in your head right then that’s okay, because there’ll be something that will happen later on that will make you go back to those early moments. 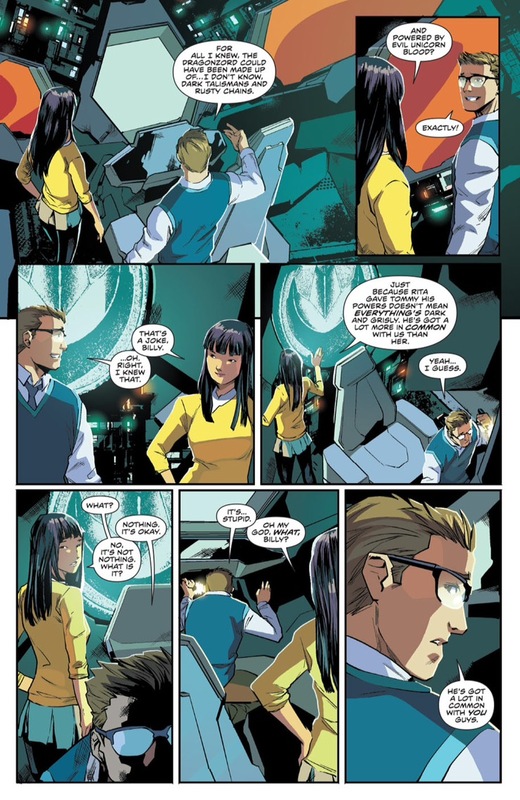 And even with that you still get those same kind of character interactions but done even more organically – from Jason and Kimberly talking after the former finishes teaching a karate class to Billy and Trini talking while tinkering with the Dragonzord. With the villains, things are much more interesting because instead of being written in a cheezy, cookie-cutter way, you have a rogue’s gallery that is just as interesting as the heroes themselves. For example, you have a Scorpina that can chew the scenery up in the most entertaining of ways yet at the same token still carry that presence of an experienced warrior who can go toe-to-toe with the Power Rangers with no problem. The fact that she would even go so far as to attack Tommy in his room or even threaten his mom only conveys the notion of her being a real threat. With Rita Repulsa things are also way more interesting because instead the usual things one would expect from everyone’s favorite headache-suffering sorceress, you got a sorceress who is playing the long-game in the most organic of ways. Even with the setbacks Rita is still making plans and getting results, and that gives a feeling of something really bad coming our heroes’ way. And of course, the action scenes themselves are nothing short of amazing. And what’s great about the comic book medium is that there are no limitations in regards to how to set up an action scene, the only limitations are the artist and writer’s own imaginations. And as such audiences get treated to not just the kind of action Power Rangers is known for, but with new additions that make the scenes more interesting, like Kimberly disconnecting her zord from the Megazord to save some people from the bridge. 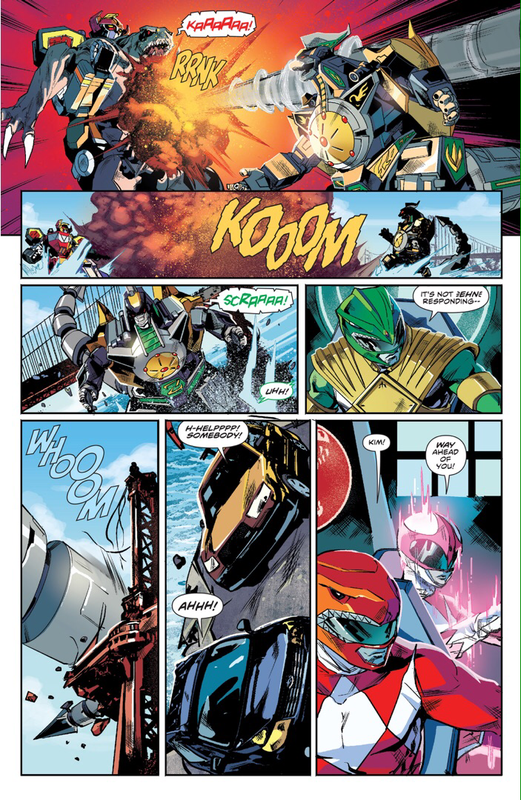 Because of the constraints of using footage from the “Super Sentai” series Saban’s team had to make do with what they had to work with and they couldn’t put those kinds of scenes in, however Kyle Higgins and artist Hendry Prasetya don’t have that problem. In all, this is a series that is more than worth your time. Even if you never were a fan of Power Rangers, the storytelling and character dynamics will hook you in without really needing much effort, and if you were fan of Power Rangers as a kid or still are (c’mon, admit it), then this also is a series that is just for you, because it reintroduces you to familiar characters but does so in a way that is new and fresh. And all the while stays true to the essence of what these characters are, which is key to any kind of successful reboot/remake. Not only that, but the medium gives it a vibe that harkens back to classic Marvel comics during the 60s and 80s, where even the small mini-stories done at the end are entertaining in the best possible way, which is something not really done much these days. So if you’re curious about this new reintroduction to Power Rangers and its original team, then I highly recommend this trade and the ongoing series. The fact that even the original cast members themselves have given their stamp of approval only shows that Saban means business with this new take on these characters, and Boom! Studios intends on delivering, and as of this post they more than have, which means we can expect more great and interesting stories that we diehards have been wanting for years, and I myself can definitely say that with both the comics and the recent film, the Power is back in a whole new way, and it is here to stay! 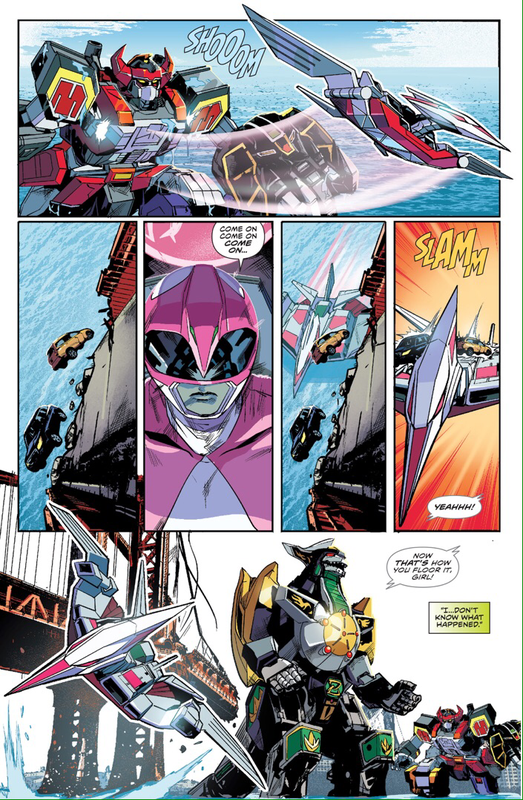 This entry was posted in Archive Entries and tagged Boom Studios, Hendry Prasetya, Kyle Higgins, Mighty Morphin Power Rangers, Saban Brands by ultrasonic9. Bookmark the permalink.